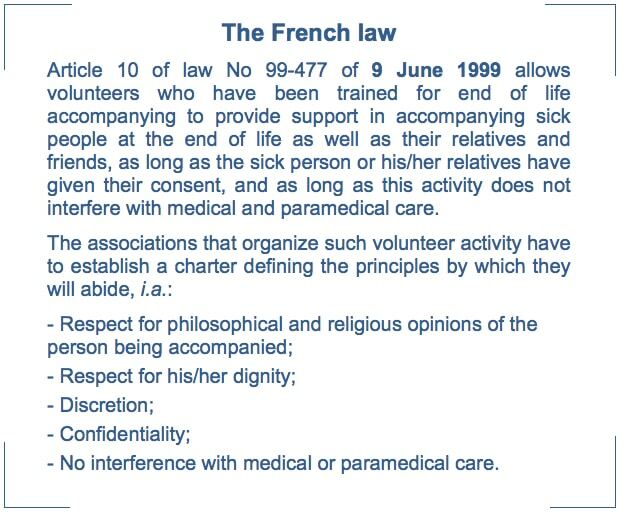 Even before the 1999 law established a framework for this secular activity of human solidarity, under the instigation of Dr. Pauq (now deceased), as soon as in January 1999, physicians, nurses and ordinary people – close friends and relatives of ill persons at the end of life – joined together to create an association with the aim to support palliative care. ASSP’s primary goal was to manage to create a mobile palliative care unit. The administrative procedure proved to be quite long before the project took shape. The founder of ASSP was just able to see the association come into being before disappearing. In the meantime, a training program for accompanying volunteers had been set up with the help of qualified people, thanks to the “Albatros” Association of Lyon. The recruitment of volunteers started after a conference given by René Claude Baud, founding chairman of the “Albatros” Association, who was involved both in accompanying and training activities; the subject of the conference was: “Palliative care, an opportunity to grasp”. ASSP worked out a Volunteer Charter and signed a convention with each medical institution which accepts the presence of volunteers alongside sick persons. Since its inception, ASSP has joined SFAP, which supervises the numerous actions taken by “accompanying” associations of this kind in France. ASSP is regularly organizing conferences in order to make people aware of the usefulness of this solidarity with ailing persons. 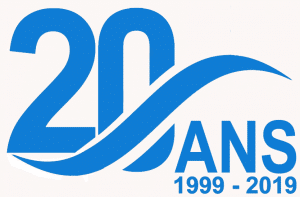 In 2009, ASSP celebrated its 10th anniversary. Some figures: 2,157 patients have been accompanied in 2010 by our 20 Volunteers. So far, ASSP has trained Volunteers for several years, but needs are growing and good will is hard to find, because accompanying people at the end of life is a very little-known activity. Wishing to join us ? Send us a letter of motivation and you will be invited to meet two members of our Bureau for an interview. Should your application be accepted, you will have to follow a seven-month training, complemented by some traineeships. As soon as Volunteers take up their duties, a support group is set up under the supervision of a psychologist, so as to support and analyze accompanying activities. A Coordinator is responsible for organizing visits of persons needing to be accompanied. The Coordinator supervises Volunteers while they are on duty. A yearly interview is mandatory for all Volunteers, in order to appraise their motivation, and all of them are required to participate in the “continuous training” sessions.